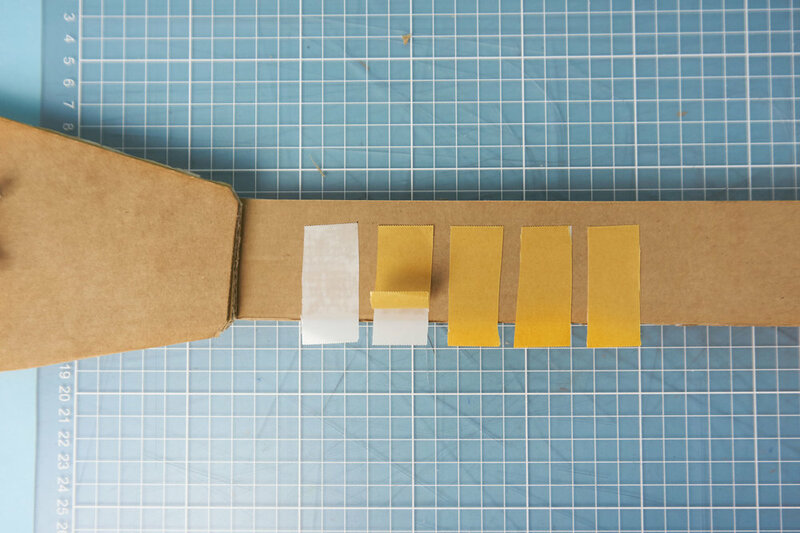 The Cardboard guitar has connections that you can press your fingers on your left hand against on the neck. Also a touch plate which you touch with your right hand. The result is similar to a regular guitar; put your fingers on a "chord" on the neck, and make it sound as you strum with the other hand. These PDF files can be used as templates for cutting by hand, or even used with a laser cutter. Combine multiple layers glued or taped together so the guitar is rigid enough! 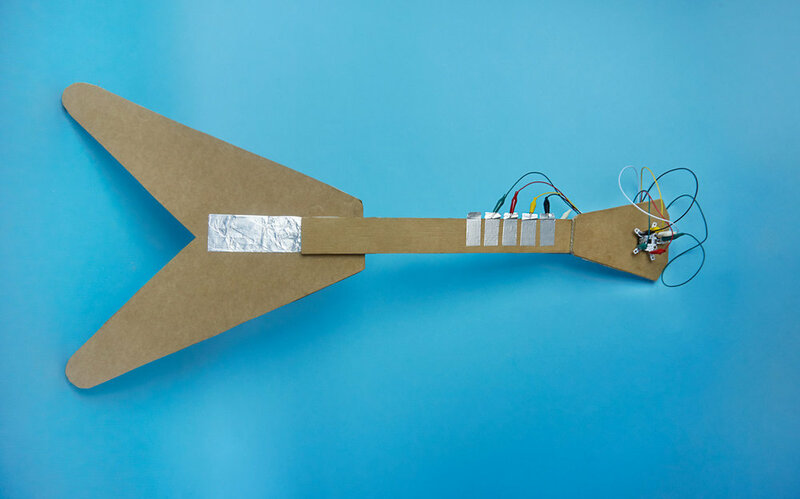 Tools you can use to build your Cardboard Guitar! Sketch the shape you wanna cut, and use a metal ruler to get nice lines or use scissors. Watch your fingertips! Cut the whole guitar shape in one piece, or do it in parts. 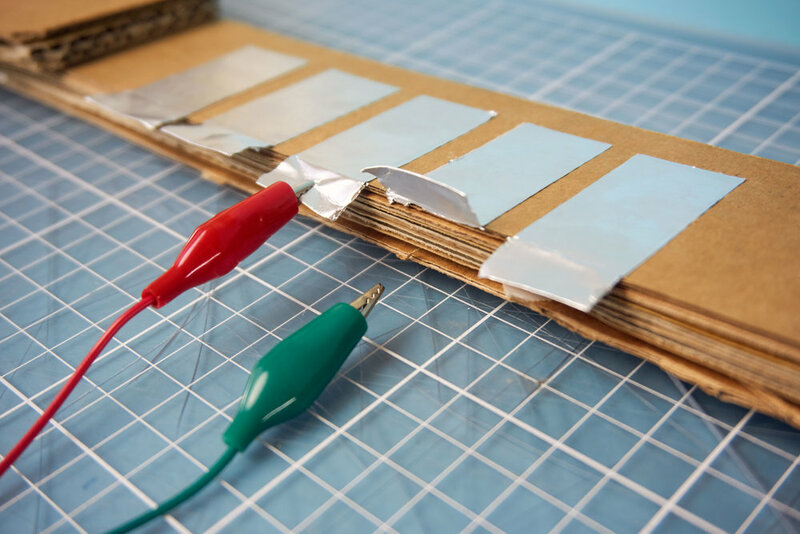 If the cardboard material is too thin, put several layers together with glue or double sided tape. This is one way of isolating one of the connectors from the base of the guitar, all the way through the neck: putting a rolled up piece of foil in between the cardboard pieces. make sure it doesn't touch anything or stick out on the way up! This is where the connection from the neck comes out on the base of the guitar. A cut-out is made to tape the Quirkbot in place on the head on top of the guitar. Note that these pieces of double sided tape is sticking out! Wrapping tin foil around the tape will make it strong and keep it from ripping appart when you connect the alligator clips to them. Notice how the tin foil wraps around even on the back of the double sided tape! Optional is to make a connection place for where the hand will rest. Just put a piece of double sided tape and make sure to leave some space at the edge, to even wrap the tinfoil around here as well for the alligator clip later. The full piece in all it's glory! One alligator clip to each of the inner holes on the legs of the Quirkbot. One leg can be used to connect to the back plate on the neck of the guitar. Connect the Quirkbot and upload your program. There are different ways to make the Cardboard Guitar function. Also, the output can be configured to fit the particular program you want to control. 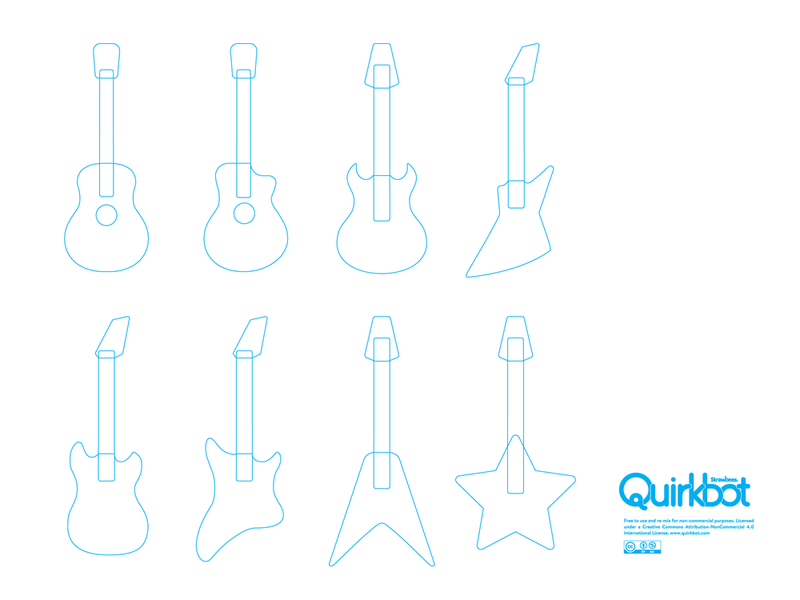 You can use Quirkbot as a keyboard that sends commands to a music program, or an online web app that creates the actual sound. We are working on putting up more interesting things here soon. In the meantime, please experiment yourself! This code outputs the keys as A, S, D, F and G.